Many of you have probably seen an advertising hoarding of an animated child that points at a passing British Airways plane being circulated on the web. Just like this ad above, over the years, British Airways seems to have developed a knack for executing simple ideas brilliantly. Today we shall see if their new social media campaign, ‘Perfect Days’, lives up to the standards that they’ve set for themselves. British Airways, one of the most preferred airlines in Europe, gives you a chance to live out ‘perfect days‘ in your dream destinations. And that too without you having to get off the internet. (Yay!) Yup, you read it correctly, all of it without the hassle of security checks! The plot of the app is nicely summed up in the introductory text that they’ve put up. That’s all they say, there’s no ‘How to play’ mumbo-jumbo; just a small ‘help’ button at the bottom left. As a matter of fact, I wasn’t even asked to like the page, I liked it anyway, thinking it was the protocol. But for the record, I wasn’t asked to. Seems like the British Airways app is beyond hogging likes, its interface and choice of text is enough indication stating that it’s catering to a smarter audience. It’s safe to say that this app is for fun and entertainment and no productivity is to be expected. It has no prizes for participating or lucky draw contests. You just have to create your dream scenario by adding some fun moments. In the app, you are asked to choose your favourite locations (one at a time), and make scenarios/situations of what took you where. 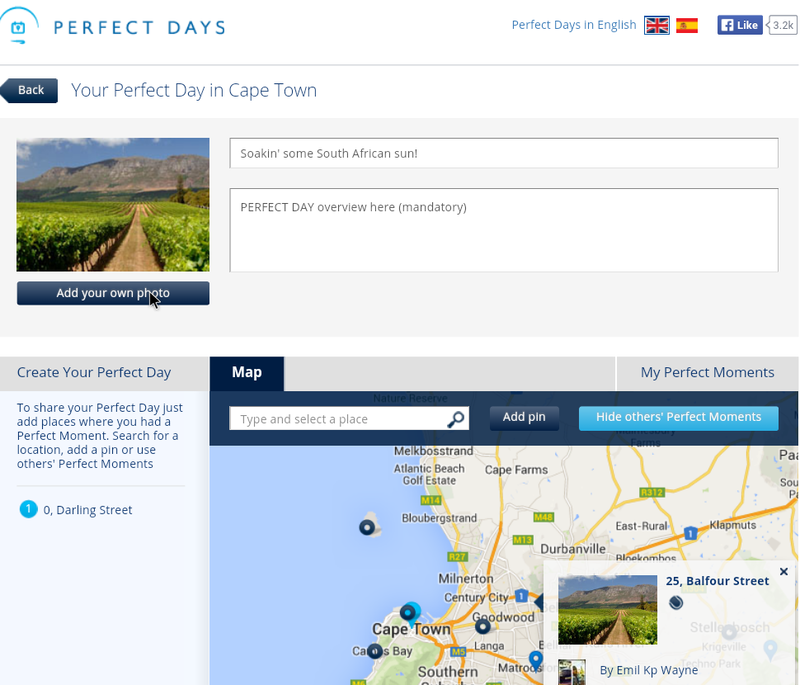 The user has to create multiple moments and add them to create a perfect day. On the top half, you see a slideshow of locations, with suggestions of places and other players’ pick of places. In the lower half of the app, there’s a world map where you can see the places you have picked. If you toggle the settings you can even see other people’s pinned places for inspiration. Personally, I loved how smoothly the map moved around. And it doesn’t end at that. 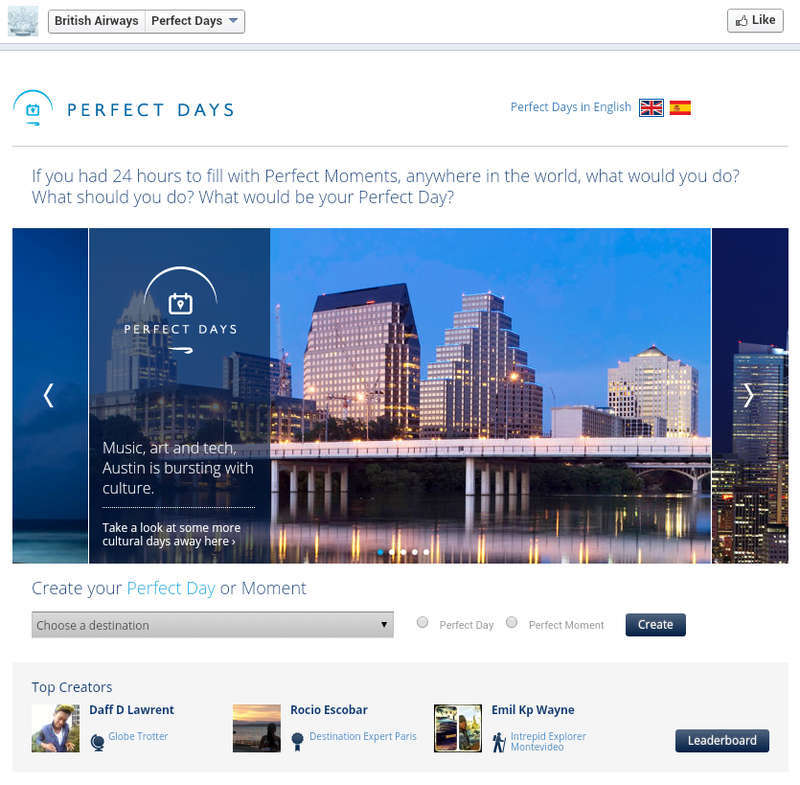 You can make multiple perfect days full of perfect moments- The more perfect days, the higher you go on the leaderboard. Which isn’t entirely a compulsion; you can play along in this app for fun, for yourself or for your friends, unless you want it to be a competition. 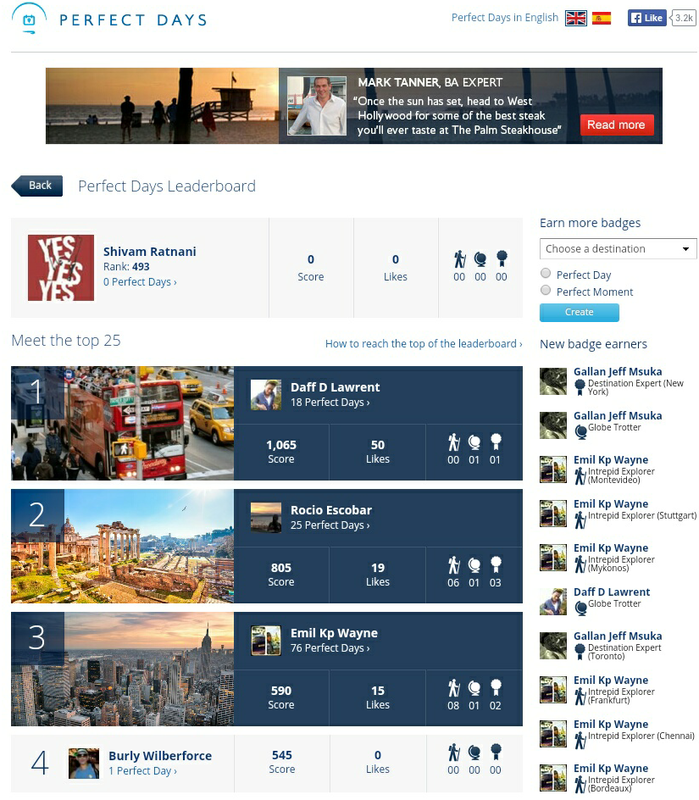 The leaderboard, it says in the help section, “is made up of the top 25 creators of Perfect Days. You get to the top by earning points. You get 5 points for every ‘Like’ and points for the badges you earn.” The badges being, Intrepid Explorer, Globe Trotter and Destination Expert. 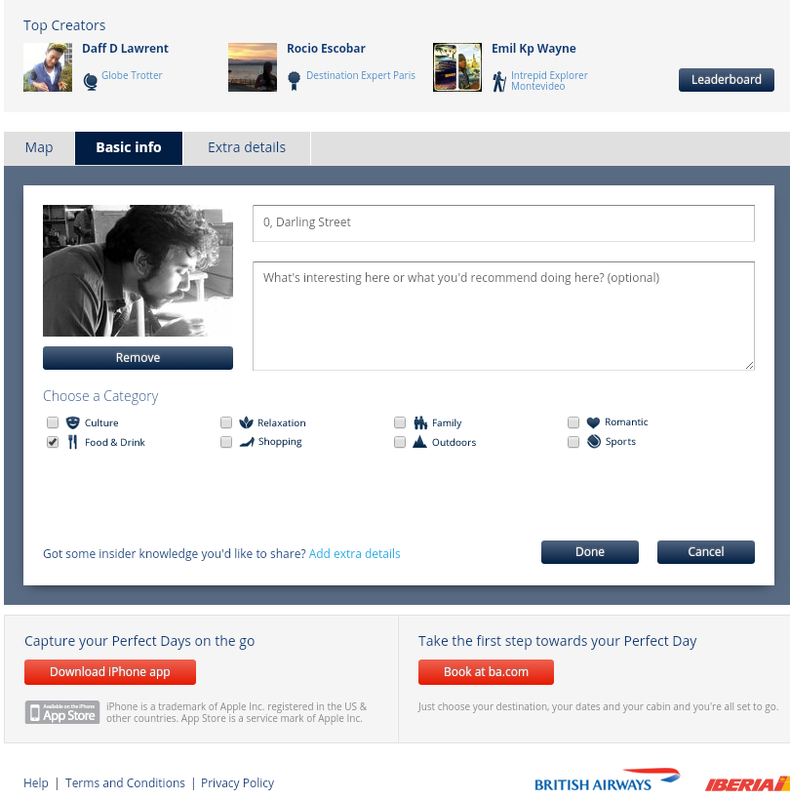 There’s a small link near the bottom, asking the user to take the first step towards their dreams by booking a trip at the British Airways website. Not too forceful, not too bad a positioning, and certainly not a bad touch! This app’s a winner for letting us live our travel dreams and giving us a little mental gratification in the process. Yes it sounds a bit lame when you imagine yourself cruising in the Bahamas, while you’re actually just sitting at your work desk computer, in front of an open spreadsheet. But then again, don’t we actually function like that? Now we can continue our daydream adventures, that too among online witnesses. They could’ve created a few scenarios for users to live out instead of them having to compulsively create a story around every location/moment. There could also have been a list of story-lines for users to go through or maybe even set up a British Airways as a hero in the process. Also perhaps, a special surrounding for every location world have been nice. Not every user is well versed with global cultures or endowed with a vivid imagination in some cases, so it could’ve been a cool addition. After a point it feels as if they make the user do a lot of work, that too for no good reason. With a fairly decent concept behind this app, I wonder what the actual motive of British Airways could have been. Surely, they wouldn’t be expecting a barrage of inspired people wanting to go out of the country. And audience engagement or like-garnering seems too petty for someone of their marketing stature. Perhaps they’d want to look at the results as a collective demographic forming the base for future marketing gimmicks? Hmm.. the possibilities are endless! But at this point this discussion is pointless.